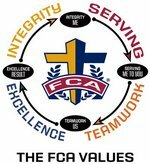 Fellowship of Christian Athletes meets EVERY Tuesday at 7:15 in the Library! First meeting will be announced as soon as it gets set. Everyone is welcome to attend...you do not have to be an athlete at Discovery.